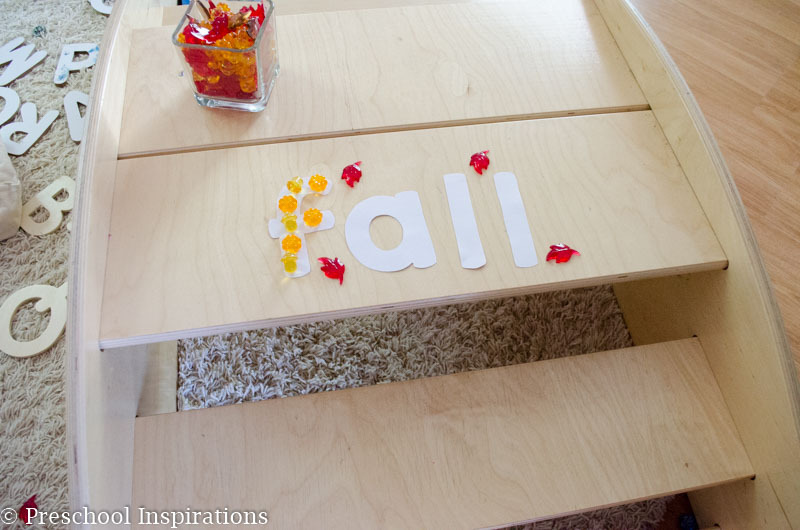 This new fall fine motor activity has been requested over and over again! 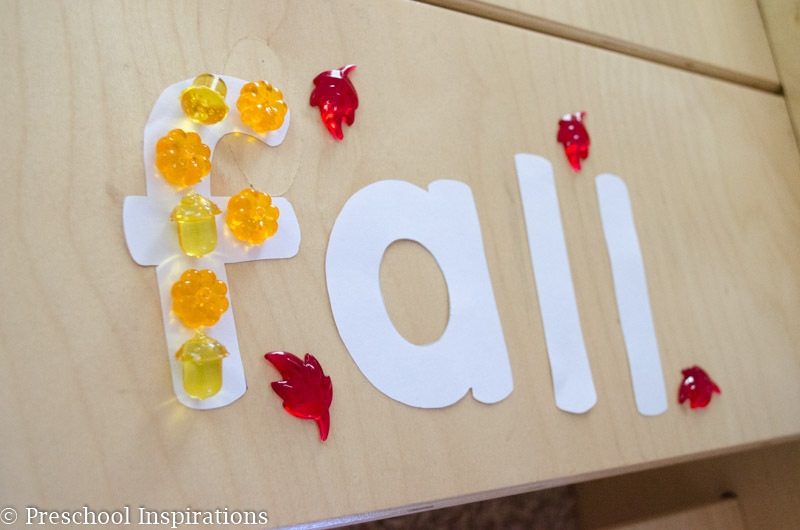 We have been using the alphabet as fine motor practice with fall jewels. I love pulling these jewels/gems out each fall. We use them for so many activities — a discovery bottle, math practice, and now this literacy activity! This is part of a fall blog hop, so find 16 more ideas after you finish reading this one. What I love about this activity is that it’s teaching children so many skills. It’s promoting the fine motor practice necessary to help with writing. We practice letter formation. 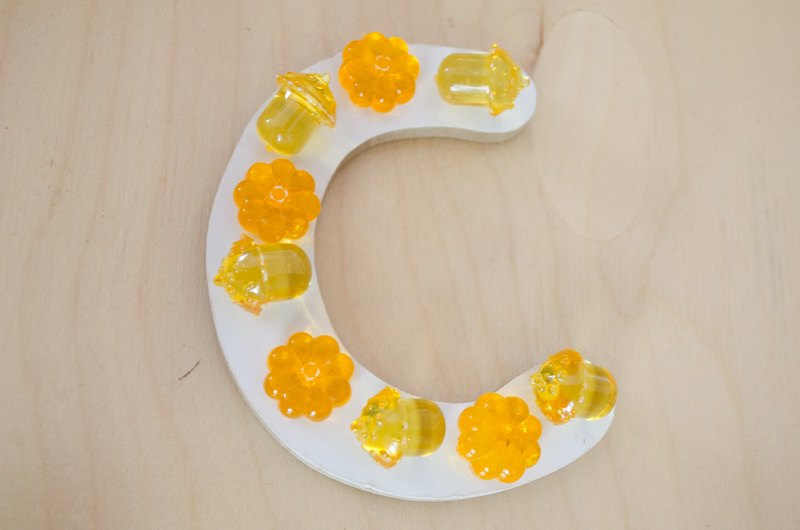 The letters have significance whether they form a word or a part of the child’s name. And it’s inviting, so the children are just drawn to it. 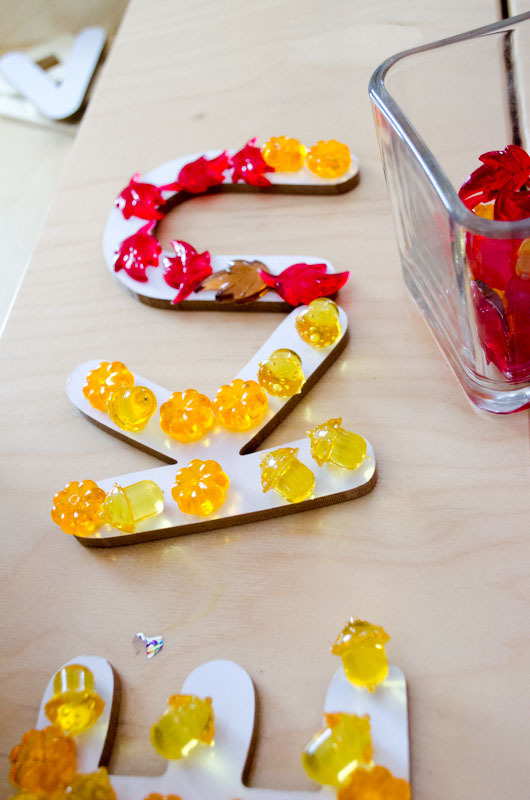 The uppercase letters letters are from Discount School Supply, and they are made of wood. They are perfect for this activity as they are nice and sturdy. I also wanted to use lower case letters though too, so I made my own. You can download the lowercase letters that I made. I recommend laminating them for extended use. And lastly, you’ll need fall acrylics. They have them available at dollar stores in the fall and Target too as well as online. Lastly, you’ll need fall acrylics. They have them available at dollar stores in the fall and Target too as well as online. We have leaves, acorns, and pumpkins. Have you noticed what I set these on? It’s not a table, but we use it like one! It’s actually a boat and a set of stairs , all in one. We love to use it as a mini activity center! Plus it’s perfect for those days we are stuck inside and need a fun activity. There are so many extensions to do with this activity. I’d love to hear about what you would do! Now, here are some more amazing fall activities!